An intuitive and professional audio editor. Soundop is an intuitive and professional audio editor for Windows to record, edit, mix and master audio contents with a clear and flexible workspace. 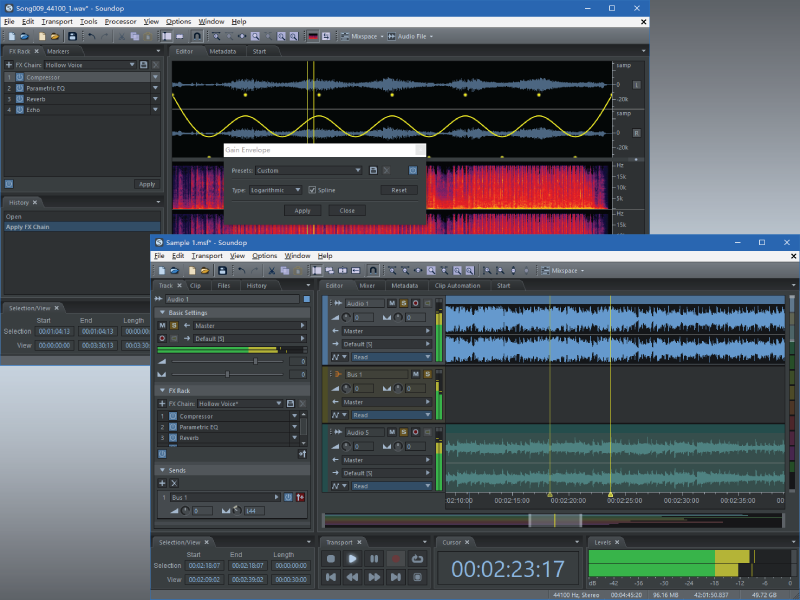 The audio file editor supports both waveform and spectrum editing. And the multitrack editor can mix an unlimited number of audio and bus tracks with a powerful engine that support sends, side-chain and automatic latency compensation. Automation of effect parameters is supported both in track and clip level. Soundop provides excellent built-in effects as well as support for VST and VST3 plug-ins to process and analysis audio. With the advanced container effects, you can create an elaborate combination of effects as a single effect. Soundop supports Low latency ASIO driver to record audio. And it can load most audio and video formats and export to major audio formats or burn audio files to CD. Metadata such as ID3 Tag, RIFF Chunk, Vorbis Comment, and ACID loop information, can be edited and saved with audio files. To perform routine operations on multiple audio files, you can use the batch processor that supports most audio editing operations.